Dominoes will take center stage in the Big Apple, when over 400 of the best players will meet to celebrate their passion for the game of Dominoes. Players from as far away as Mexico, Jamaica, Colombia and Spain will travel to New York to compete with players from the U.S. to determine who is “El # Uno” in the sport. 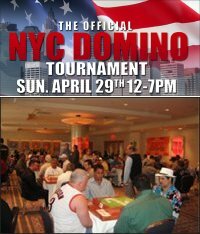 The NYC Domino Tournament, Sun April 29, 2007 12-7pm at Latin Quarter is the first of a Series of events that will be hosted in the New York area by worlddominotournaments.com, a site published by R. Paniagua Inc., a company based in New York that has focused on multi-cultural programming for the past 25 years. The format of the Tournament will be Double Six with no elimination. Instead each two-man team will play five 200-point games with a 40-minute time limit per game, and then the top teams will vie in the sixth game for the title. The Final eight teams will be filmed to broadcast in the U.S., Mexico, the Caribbean and other key markets of interest. Upcoming events include the Puerto Rican Parade Tournaments on June 9th and the Dominican Day Parade Tournament on August 5th, two huge weekend events in New York. These will culminate with a multi-city event that concludes in Las Vegas in the Fall of 2007. For more information, visit worlddominotournaments.com.